House Market Watcher: Plastic Windows; Should You Choose Them Over Wooden Designs? Plastic Windows; Should You Choose Them Over Wooden Designs? There are various types of windows available on the market today which offer a number of designs and added features for customers to choose from. Since windows are such an important feature of your home, the materials used to construct them should be considered when deciding on the best windows to purchase. Although the use of uPVC windows is increasing in popularity, one should also consider the positive characteristics including maintenance and longevity of wooden windows. In a survey which was conducted by British Heritage, various estate agents were asked about their opinions regarding the use of wooden windows. The belief that a home's value increased with the use of features that were more original like wooden windows was reported by approximately 82% of those questioned. 78% of agents questioned also stated that they believe that homes which used quality wooden windows tend to sell faster than homes sporting uPVC windows. The durability of quality wooden windows is demonstrated by the fact that many windows that were constructed from timber are still being used, and are completely functional after over a century's use. This is due to the inexpensiveness and ease with which damaged wooden windows are repaired. Repairs required by uPVC windows, however, are often expensive and difficult, and usually result in replacement instead. With this in mind, wooden windows are clearly the better choice. Although the popularity of plastic windows has increased due to a common belief that uPVC windows offer less maintenance, further investigation will reveal that a number of plastic windows show early signs of weathering and deterioration. Various products, in fact, have been placed on the market claiming to reduce the appearance of staining and discolouration, assisting in the preservation of plastic windows. When energy efficiency is considered, it is important to understand the true characteristics which influence the efficiency of a window. The efficiency of a window is mostly affected by the glazing within a window, and not the materials used to construct the actual frame of the window. Although many people believe that uPVC windows are much more energy efficient than timber windows, when the frame of the window in considered in determining the efficiency of a window, it is important to note that wood is more thermally efficient than plastic. Wooden windows are also more versatile when it comes to sealing gaps to prevent drafts. 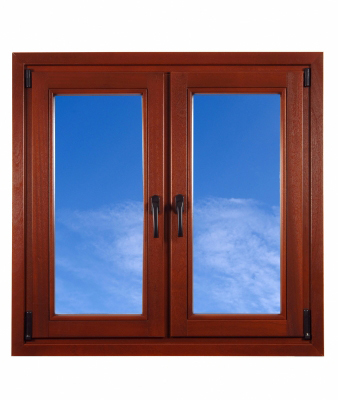 While plastic windows are harmful to our environment, in most cases, wooden windows are environmentally friendly, when the proper products are used in conjunction with the timber, such as environmentally safe preservatives, paints, stains, and sealants. It is also important to remember that wood is a sustainable resource. With the economy in such a difficult stage, the cost of purchase and maintenance over the lifetime of a window should definitely be a consideration. Research conducted by The Wood Window Alliance revealed that wooden windows can be from 2-7% more economical than windows that are constructed from uPVC. The replacement of your homes windows is a big decision, and one that should be carefully considered. It's important to remember the positive characteristics of wooden windows, and not limit yourself to the choices offered in uPVC. For help and information on replacing your windows get in touch with You Choose Windows today.